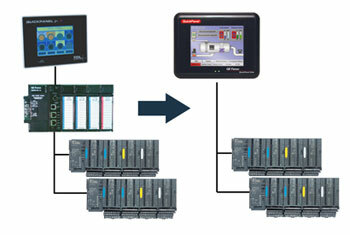 Now your Operator Interface can control your application and connect directly to your PLC I/O structure. Available in a variety of display sizes, QuickPanel Control from GE Intelligent Platforms combines control and visualization into one platform for maximum productivity and cost efficiency. By integrating the GE QuickPanel family of touch screens with Proficy Machine Edition software, QuickPanel Control delivers flexible, scalable performance on a rugged hardware platform. Furthermore, the intuitive environment of Proficy Logic Developer – PC software helps reduce application development time and makes connectivity easy with a family of Ethernet and Fieldbus interfaces. Find Price and Availability on any Quick Panel Control part by clicking on the 'In Stock' or 'More Info' button.